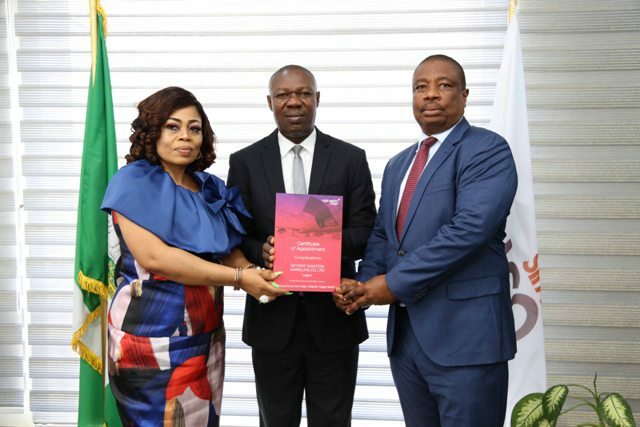 * Skyway Aviation Handling Company PLC (SAHCO), Managing Director/CEO,Basil Agboarumi (centre) flanked by SAHCO, Executive Director, Cargo Services and Operations, Mrs Boma Ukwunna (left), SAHCO, Executive Director, Sales and Marketing,Olaniyi Adigun (right) after receiving the Certificate of Appointment from Virgin Atlantic. Skyway Aviation Handling Company PLC (SAHCO) has signed an agreement with Virgin Atlantic Airline to handle its cargo operations. A statement signed by the Manager Corporate Communications, SAHCO, Mrs. Uansohia Adetola, explained that SAHCO Plc was chosen by the airline based on the company’s track records in cargo, ramp, passenger handling, warehousing among other ground handling activities in the aviation sector in Nigeria and West Africa Sub-region. She added that the airline Cargo awarded the handling contract to SAHCO in Lagos to improve its service offering for customers in Nigeria and to provide growth capacity following a 19 per cent boost in the airline’s export volumes last year and higher inbound demand from the pharmaceutical and courier sectors. He stated that from April 10, 2019, Virgin Atlantic’s import and export cargo would be handled in SAHCO’s 22,000 sqm warehouse operation at Murtala Muhammed International Airport. She added that this special facilities including cold rooms for perishables and temperature-sensitive shipments, and dedicated locations for courier and high value cargo, adding that the warehouse building’s 22 truck loading bays will expedite collections and deliveries of cargo, while 24/7 CCTV coverage, access control systems, screening technology and a control room will ensure the highest levels of security. Speaking, Director–Cargo Operations, Virgin Atlantic, Tonia Boye, the contract with SAHCO PLC will help boost the company’s cargo business. Revenues ex UK rose 9 per cent year-on-year, helped by a 135 per cent rise in pharmaceutical volumes and a 21 per cent growth in courier shipments, while the 11 per cent boost in annual revenues ex-Lagos was largely attributed to higher perishables traffic because of the Nigerian government’s initiative to encourage agricultural exports. Be the first to comment on "SAHCO Signs Cargo Handling Deal With Virgin Atlantic"